An insect finds a place to rest upon a lily pad in a swampy pond in Algonquin Provincial Park in Ontario, Canada. 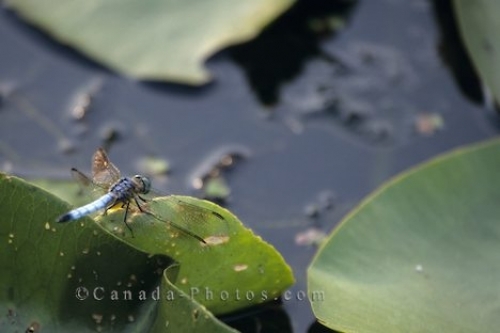 Algonquin Provincial Park in Ontario, Canada has many small ponds with lily pads blanketing the surface and this insect decided this pond was the perfect spot to relax. An insect of this size should always be wary around a pond as you never now what lurks under the water looking for a tasty meal. An insect by a pond in the Algonquin Provincial Park, Ontario, Canada, North America. Picture of an insect atop a lily pad in a pond in Algonquin Provincial Park in Ontario, Canada.